The research group Mechanical Properties of Interfaces carries out atomistic simulations to understand the fundamental processes occurring at interfaces under different loading conditions, which determine strength and deformability of polycrystalline microstructures in metals and alloys. 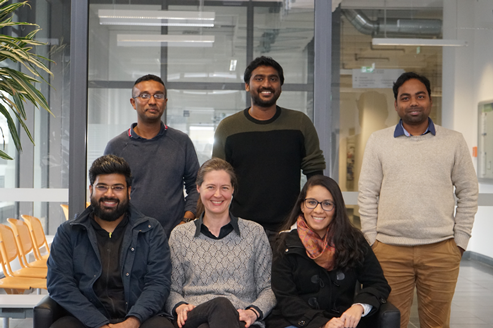 The Janisch group in March 2019 (from left to right): Ashish Chauniyal, Masud Alam, Rebecca Janisch, Smobin Vincent, Abril Azócar Guzmán, Anupam Neogi. Ab initio electronic structure calculations based on density functional theory (DFT) are used to predict the energy, strength, and effective modulus of interfaces and other defects. 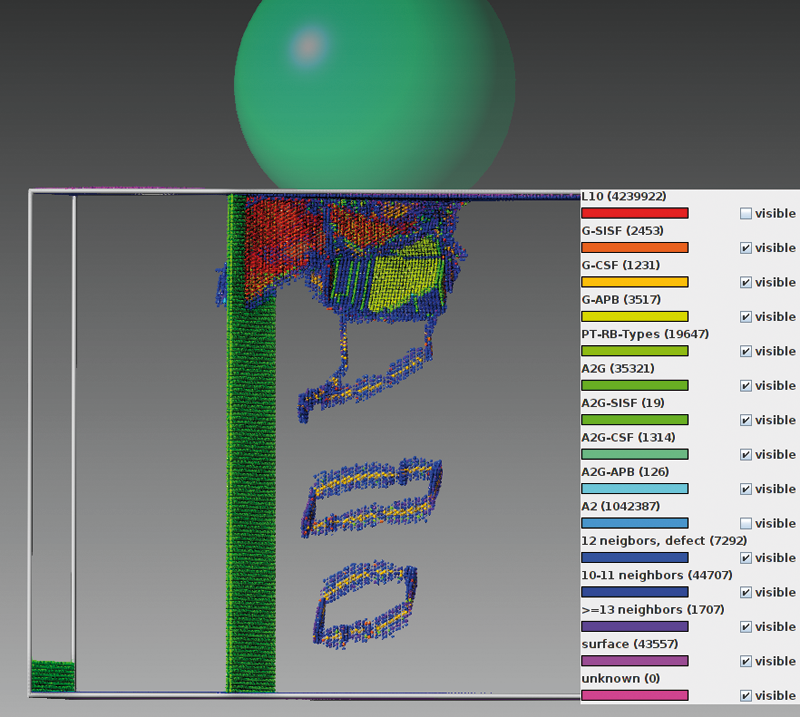 These characteristic properties are used to derive and understand trends, give guidelines for alloy design and to establish constitutive relationships for multiscale simulations. Large scale molecular dynamics simulations are carried out to determine the fundamental deformation mechanisms – interfacial sliding and/or migration, dislocation emission, twinning – at different interfaces and temperatures during tensile and shear load, or during nano-indentation. If possible, these mechanisms are then related to fundamental physical quantities, such as bond length and energy, coordination numbers, and stacking fault energies. Our recent projects focused on the interplay between mechanical deformation and solubility and segregation in Fe alloys, including H embrittlement, on size effects in lamellar TiAl and the stability of different phases in TiAl alloys. 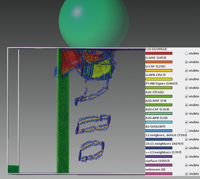 Methodological work included the implementation of a design of experiment scheme to sample the energy space of grain boundaries, and the development of a force based scaling model that enables the use of DFT data in finite element simulations of fracture. 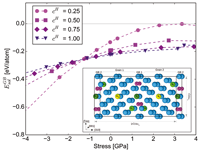 Influence of tensile and compressive stress on the solution energy of hydrogen for different site occupancies at a Σ5 grain boundary in an Fe-C alloy. 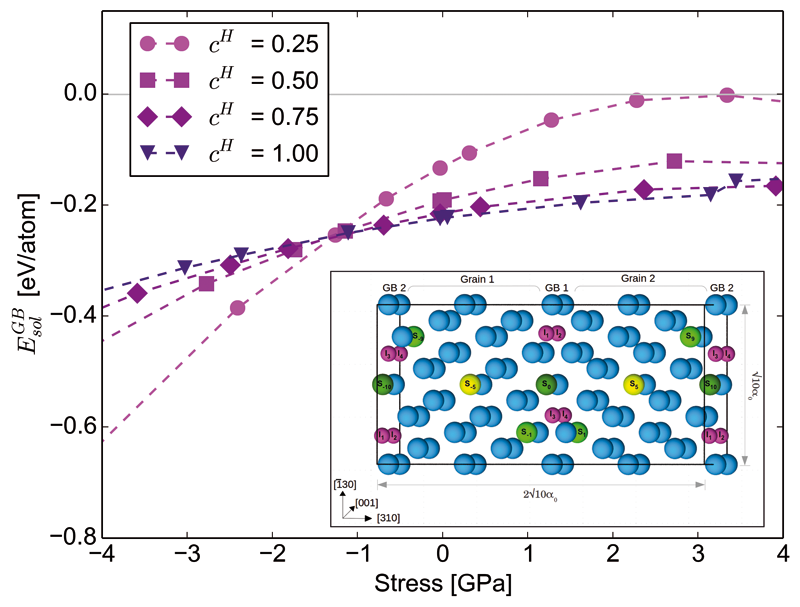 For compressive (tensile) stress, the lowest energies are obtained for minimum (maximum) concentration of H.
Snapshot of a molecular dynamics simulation of nano-indentation into a two-phase Ti-Al alloy. Atoms with perfect coordination (α2/L10) are not shown. The interface between the two phases (layer of green atoms) confines the dislocation motion.